FILE - Smoke rises into the air after Taliban militants launched an attack on the Afghan provincial capital of Ghazni, Aug. 10, 2018. Afghan officials claim that dozens of Pakistani nationals were among more than 400 militants killed in fierce battles in southeastern Ghazni province in the past several days. "During the Taliban attack in Ghazni province, over 400 terrorists were killed, including 70 Pakistani nationals whose bodies are ready to be transferred to Pakistan in Jahangir Bazar, a local market located between Muqur and Gelan districts [Ghazni province]," said Wahidullah Kalimzai, governor of Ghazni province. Kalimzai added that other foreign nationals were among the dead militants during battles. He also said at least 100 Afghan national security forces and dozens of civilians were killed. "Some of the dead bodies of Chechens remain in the battlefield. Documents found in their position prove they were Chechen nationals," the governor said. The Afghan Ministry of Defense also said it confirmed the presence of Pakistani nationals fighting in Ghazni province, but did not give details pending an investigation. "Pakistanis are involved in the southeastern Ghazni battle. The clearing operation is still underway, and we are investigating this issue," Sayed Ghafoor Ahmad Jawid, a spokesperson for the Afghan Ministry of Defense, told VOA. 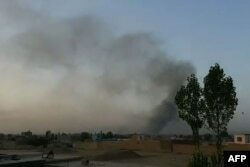 FILE - This screen grab taken from AFPTV video on Aug. 10, 2018, shows smoke rising into the air after Taliban militants launched an attack on the Afghan provincial capital of Ghazni. Afghan authorities have long accused Pakistan's spy agency of backing militant fighters in the region, which Pakistani authorities have denied. But the Ghazni attack has revived the issue. Last week, the Afghan army chief of general staff, General Mohammad Sharif Yaftali, said Pakistan's Inter-Services Intelligence (ISI) was behind the five-day siege of Ghazni. "Pakistan is the springboard of international terrorism. All terrorists first land in Pakistan, where they get armed, equipped and then sent to Afghanistan to fight," Yaftali told reporters in Kabul. He also said many members of Lashkar-e-Taiba, a U.S.-designated terror group, were among those killed in Ghazni province. Pakistani officials reject the Afghan government's allegations that Pakistani nationals were fighting alongside the Taliban against Afghan government forces. "We have no evidence to back up these comments, hence we reject the reports of Pakistanis killed in Ghazni attacks," Muhammad Faisal, a spokesperson for Pakistan's Ministry of Foreign Affairs, told VOA. "We condemn the heinous attacks in Ghazni and want to reiterate that Pakistan wants a peaceful and stable Afghanistan," Faisal added. Jawid, the Afghan Ministry of Defense spokesperson, said, "We will share all the evidence with the Pakistani government and our international allies, including the U.N., once they are complete." Reports from Pakistan's border region in recent days have cited local officials and social media photos and videos appearing to indicate that militant groups have transported dead fighters from the Ghazni battle back to Pakistan for burial. Afrasiab Khattak, a former senator and current senior member of the Awami National Party, asked his own government to explain the bodies when authorities insist no Pakistani nationals were involved. "The dead bodies from the southeastern Ghazni battle that were shifted to Pakistan — some Pakistani groups have posted photos of the dead bodies and have invited people to attend funeral ceremonies of their members on social media. 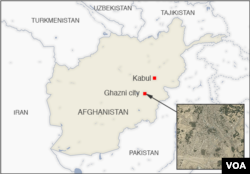 These groups have proudly stated that those men were killed there [in Ghazni]," Khattak told VOA. Pakistan's Foreign Ministry spokesman said Islamabad has not received any evidence to back up the claims. Local sources in Pakistan told VOA that bodies have been transported to different provinces of Pakistan, including Khyber Pakhtunkhwa, Punjab and Baluchistan, from across the border. According to these sources, Usman, a militant commander; Haq Nawaz, a militant from Hangu district; and Rashid Badini, a militant from southwestern Baluchistan province, were among those killed in Ghazni, and people were visiting their families to offer condolences. Local Pakistani officials, who spoke on condition of anonymity because of the sensitivity of the issue, told VOA that many Pakistani militants killed in Afghanistan allegedly belonged to Mullah Nazir, an allegedly pro-government militant group. They also said dozens of dead bodies were taken to Punjab's Multan, Dera Ghazi Khan, Bahawalpur and Khara areas. The dead bodies allegedly were brought from Wana from Afghanistan, where they were transported to southern parts of Punjab province. VOA could not independently verify these claims. U.S. and Afghan officials have long accused Pakistan of being selective in its campaign against militant groups operating in the country. In January, U.S. President Donald Trump charged that Islamabad had failed to take action against terror safe havens in Pakistan and suspended military aid to the country. Pakistani officials deny the charges and maintain that the country has equally targeted all militant groups and suffered enormous losses. Aizaz Ahmad Chaudhry, Pakistan's outgoing ambassador to the United States, told VOA in an interview in May that his country had done the most against terrorism in the region and that no country could accuse it of not doing enough. "Al-Qaida, if you don't hear about it today, it is because Pakistan and the U.S. were cooperating. Al-Qaida is the organization that caused 9/11, and therefore, we think that no country can tell us that Pakistan has not done enough. In fact, Pakistan has done the most," Chaudhry said. VOA's Madeeha Anwar contributed to this report from Washington.